Cotton can be cultivated only in warm places. 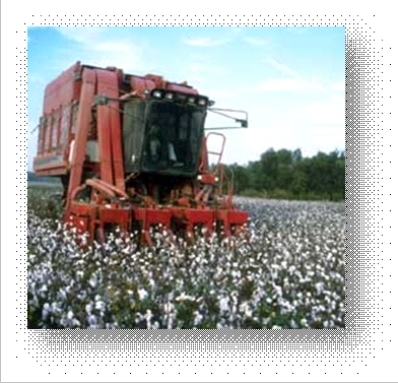 Cotton requires about 6 months of continuous warm weather with adequate moisture and sunlight. Frost is harmful to the plant. The plant is perennial but, after a few seasons the value of the crop deteriorates both in quality and quantity. The best results are obtained when it is cultivated as an annual. In order to maintain a high standard of quality, constant alteration to proper methods of cultivation and the use of fertilizers is necessary. The ground must be thoroughly plighted and the soil is pulverized. Carefully selected cotton seeds are planted in rows, usually in March or April approximately 35 days pass before the seeds develop. The cotton plants must be protected from being crowded by weeds. The plants are generally thinned out and weeded where they are from 5 to 7 inches tall. The young plants develop creamy white flowers in June which turn pink and then to reddish purple. Within three days their petals fall off, leaving the ripening seed pod. The fibres that grow from the surface of the seeds cause the pod to expend to about an inch in diameter and to an inch and a half in length to form the cotton ball. The cotton balls grow to full size by August, a month and a half to two month after the flower first appeared. When fully grown, the cotton plant may be from 3 to 6 feet in height. When the seeds are nearly ripe the pod bursts open and the cotton hairs project, forming a white fluffy mass. The fibres are now exposed to sun, when they complete their ripening and the content of the cell gradually arise up, leaving the cotton in a fir state for harvesting. The proper drying up of the cell in sun is a very important factor in producing one of the essential properties of cotton, namely its characteristics twist. Not all cotton balls open at the same time. Only those that burst, thus exposing the fibre, are ready for picking consequently, a hand-picked cotton field must be gone ever several times. When mechanical pickers are used the balls are left on the plant until they are all mature. Although some leaves will have fallen off by then, plants are defoliated by spraying than with chemical causing the remaining leaves to wither and fall. The full, ripe bools are then picked by machine, one or two rows at a time.